Wednesday 2/27: Nothing at Dunback, guess I missed getting grosbeaks for the month. Thursday 2/28: Yard day, nothing of note. Friday 3/1: Meriam’s and Kaveski. No luck with Bob’s grosbeak but did have a Fox Sparrow. Saturday 3/2: Thought it was going to be a yard day but the storm was a bit of a bust, so did a quick loop midafternoon. Two eagles on the ice on the Mystic Lakes but no cormorant or much else. Chipping Sparrow was still at Mt. Pleasant (61 species in every month for the county), usual at Blair Pond. Sunday 3/3: Birders’ Meeting for most of the day. Stopped at Wachusett Res on the way home and got both Horned Grebe and Snow Bunting for Worcester county (#150 and 151). Monday 3/4: Snow day, normal stuff in the yard, I missed the first grackle of the year. Tuesday 3/5: Riverwalk was quiet. Wednesday 2/20: Nothing of note at Dunback. Thursday 2/21: Bit too slick, so just buzzed Pelham Island Rd. Pileated flew across and 2 teal were in the swamp. Friday 2/22: Peregrine at Forest Grove, eagle at Norumbega. Saturday 2/23: Started with a Winthrop loop. Snowy visible from Deer Island plus lots of ducks. First presumed migrant grackle on the greenway. Nothing at Belle Isle. Continued home along the Mystic. Usual at Draw Seven and Station Landing. RB Mergs made it up to the lower Mystic Lake. Pulled in at Mt. Pleasant and finally caught up with the Chipping Sparrow there. Monday 2/25: Couldn’t get to Nashawtuc due to an accident. Nothing much on Pelham Island Rd. Tuesday 2/26: Still too cold. Did Nine Acre and saw even less than yesterday, then the Water Row area (Wood Ducks at the Old 27 Bridge) and Pelham Island Rd. Wednesday 2/13: Still too snowy for much. Tried a drive through of Norumbega but the lot wasn’t plowed and it looked like gulls and nothing else. Thursday 2/14: Nothing of note at Dunback. Friday 2/15: RB Merg along Moody St but not much else there or at Purgatory. 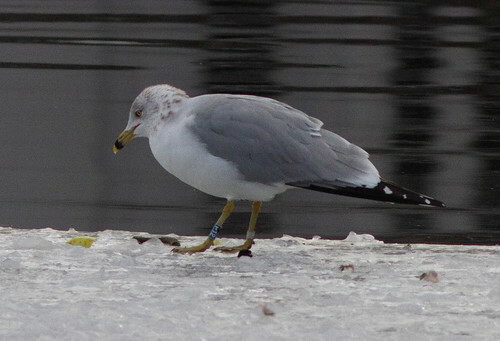 Did have a banded Ring-billed Gull, which was from Montreal, slightly more movement than the last one I reported. Saturday 2/16: Red-wings singing from the yard first thing. Attempted a central MA loop. No Snow Buntings at Wachusett in a short walk, 3 loons about it. Headed north from there and ran into either unplowed or iced over lots just about everywhere. Did take a long walk at Townsend State Forest, which had chickadees, titmice, nuthatches, jays, ravens, juncos, and a dove. Gave up after that and headed to School St (crows) and Dunback (nothing). Sunday 2/17: Horn Pond had a redpoll, a bunch of Red-wings, and 2 wigeon. Nothing at Mary Cummings. Both loons at Draw Seven, not much at Earhart. Tuesday 2/19: Red-wing and little else at BBN. Wednesday 2/6: Little chase. Swamp Sparrow was the only other bird of note. Thursday 2/7: Got the siskins at Thoreau, little else. Nice little tour from David though. Friday 2/8: Dunback got rainy. Did get Purple Finch for the commute list but no grosbeaks or anything. Saturday 2/9: Chipmunk in the yard to start the day. Too windy for much, but did a Meadowbrook/Mystic Lakes loop. Nothing of note there. Stopped briefly at Blair Pond (Common Merganser was the most interesting although Mute Swan was new for me there) and Fresh Pond (nothing) too. Sunday 2/10: Started with a Concord/Acton loop. Nothing at Nine Acre, School St, or the sand pits. Decided to work the Charles a bit. Nothing new at either Moody St or the riverwalk. Stopped at Gore and couldn’t find the Chipping Sparrows. Monday 2/11: Barred Owl flying off and little else at Heard Farm. Tuesday 2/12: Zip at Kaveski. Thinking my goal of six new commute birds might be a bit too easy, this is already #3 for the year (shrike and crossbill). Wednesday 1/30: Forest Grove was very quiet but did have a couple redpolls fly over. Weird domestic at Norumbega too, maybe the thing that had been reported as a Snow off and on. Thursday 1/31: Too cold, House Finch in the yard. Friday 2/1: Still too cold. 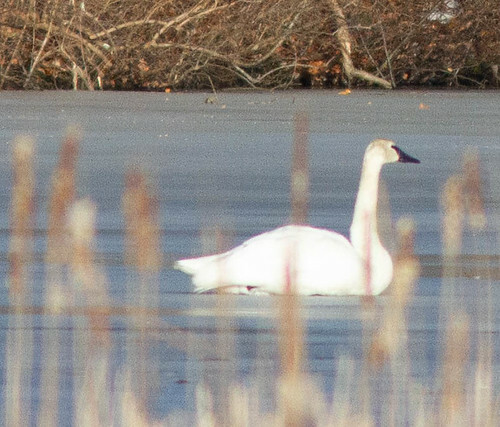 Did check Pelham Island Rd and had a couple Common Mergs, 5 geese, and 2 swans. Saturday 2/2: Wandered Dunback a bit. Coyote, Winter Wren, Yellow-rump, not much else. Did a loop of Concord Ave, Wilson Farms (mostly to confirm the gulls at Dunback were from there), and the res without anything. Sunday 2/3: Nothing at the lower end of the Mystic Lakes. Flock of redpolls and an eagle on the Wellington Greenway. Redpolls moved across the river to Earhart but couldn’t get the eagle from there. Continued to Lynn and King’s Beach but tide was wrong and no Mew Gull(s). Did have 2 banded Ring-bills and FOY Sanderlings. Quick check of Winthrop Beach looked pretty dead, so swung into Belle Isle to check the feeders before heading home. Hermit Thrush flushed as I pulled in, not much else there. Did hear about a Barred Owl on the Winthrop Greenway, so went over there but no luck. Monday 2/4: Raven, Rusty Blackbird at the Wayland Community Gardens. Tuesday 2/5: Eagle, goldeneye, not much else at Great Meadows. Wednesday 1/23: Riverwalk was busy but just the usual. Thursday 1/24: Too rainy. Nothing but starlings at Nine Acre, black ducks, swans, geese, and mallard on Pelham Island Rd. Friday 1/25: Usual at Wayland Community Garden. Probably walked past a Barred Owl but did get cowbird to finish 24 half-months. Saturday 1/26: Started at Horn Pond, which was quiet beyond a flyover Red-wing. Continued up to Lowell. Iceland Gull at the boathouse, Turkey Vulture and a few other things at the Tsongas Center (BC Chickadee, junco, Song Sparrow new for Lowell). Sunday 1/27: Tried for a few year birds locally, not overly successful. First stop was Cousin’s Park, where I did have siskins within seconds of getting out of the car. Also had the 8+ Chipping Sparrows and some bluebirds. Geese and Horned Lark at School St, couldn’t find the Red-shoulder, Savannah, or Pileated at Meriam’s and Kaveski (or much of anything). On to Cambridge. Got the GW Teal at Alewife but no Wood Duck. Fresh Pond was very quiet, no ducks at all and I didn’t find anything among the gulls. Think that made me two for seven or so, probably not hitting 100 before the end of January (need 6, which seems unlikely without a weekend). Monday 1/28: Looped the marsh at BBN and saw nothing. Had a couple minutes for the parkway after. Tuesday 1/29: Tried Meriam’s and Kaveski again. Still no Red-shoulder but a Pileated did fly over. Patch #175, Commute #221 too. Wednesday 1/16: Winter Wren, Barred Owl, not much else at BBN. Thursday 1/17: Poked a bit along the river in Wayland as it was too cold to walk. RC Kinglet on River Rd was a bit of a surprise. Heard what was presumably an otter crash into the water at the Old Rt 27 bridge. Friday 1/18: Snow didn’t happen overnight but still went to the riverwalk. Decent numbers of Bufflehead, Hoodies, a couple Ring-necks. Path to Landry was taped off, so drove over to Moody. One Song Sparrow, so ran to Cronin’s too. Usual there but the first Great Black-backed I’ve had in Waltham in a couple months. Server farm issues at work meant I got to leave early, so I went to Crane Swamp to look for the Clay-colored. Eventually found the junco flock but no sparrows with them. Did have a Peregrine buzz over, which somehow was a county bird but little else. Also buzzed Big Chauncey with no interesting gulls and School St, Flint’s, and the res all with zero birds. Saturday 1/19: Started at Draw Seven. Lots of RB Mergs but not much else. Checked Earhart for the hawk again, no luck with that but a creeper was new for me in Everett. Continued to Belle Isle. Lots at the feeder but nothing of note. Started to walk around and heard a chip in the pine that had the Orange-crowned back on 12/8. Picked up movement and was shocked to see a Nashville instead. Which was then joined by an Orange-crown. Guessing it’s the Nashville that was across the water on the greenway side, but only about the 5th record I can find for January (one a couple weeks ago in Fairhaven though). Nothing much else there, so went to Revere Beach. Scoter flocks still around, but didn’t look like a ton of gulls and the wind was strong, so I doubled back to Deer Island. Surprisingly, the wind wasn’t bad. Four plus Iceland Gulls, 3 Razorbills, lots of eider. No luck with any grebes though. Headed home from there with a brief detour for the Barrow’s Goldeneye off Bayswater. Sunday 1/20: Yard birding, nothing exciting. Wednesday 1/9: Great Meadows was very quiet. Nothing but geese and swans (and a muskrat/beaver) in the impoundments, a few creepers and Swamp Sparrows near the river. Thursday 1/10: Dunback was quiet beyond the grosbeaks. Friday 1/11: No luck with the Rough-leg at Meriam’s. Not much of anything there. Saturday 1/12: Once it sort of warmed up, went to Draw Seven, which was pretty quiet. 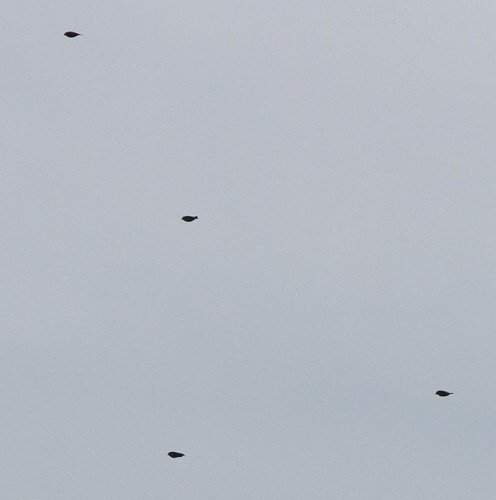 Earhart had the hawk from 12/22 but I had left the camera in the car and couldn’t find it again after running back. Greater Scaup at the Mystic Lakes was about it for birds of note there. Sunday 1/13: Chased a few county birds. Success with the Clay-colored and White-crowned sparrows at Hollyhood Cemetery in Brookline and the Cackling Goose at Jamaica Pond. No luck for a January BT Blue at Hall’s Pond though. Monday 1/14: Tried for the Rough-leg again. No luck with that, did have a few waxwings and a ton of Tree Sparrows. Tuesday 1/15: Started at Forest Grove. Just the area by the pumphouse was open and I picked out a female pintail pretty quickly (and then spent 15 minutes waiting for it to raise its head to confirm). Decided not to walk there and doubled back to Moody St. Usual birds there. Had time to pull in at Norumbega, nice eagle in the trees.